This is one of a series of pages about learning to read tarot cards. It follows the introduction to learning tarot which briefly lists and comments on various aspects of learning to read tarot cards. What is meant by "Learning to Read Tarot Cards" ? Although this topic may seem well-defined it's useful to be aware that people use tarot cards in different ways, including reading tarot cards in different ways. For example, are you interested in learning to read tarot cards individually - so, just taking one card at a time, as one might with Oracle Cards and especially with Angel Cards ? Alternatively, do you want to learn to read Tarot Spreads ? In the latter case you need to learn about the spreads as well as about the individual cards. What is involved in Learning to Read Tarot Cards ? In order to offer a complete answer to this question we'll assume you're interested in learning to use tarot cards to do complete tarot readings (using tarot spreads - not just looking at individual cards, which can also be extremely useful). There is therefore a lot to learn, especially if you are starting from scratch, so we'll itemise important stages in the form of a list. Look for basic information online, in books at your local library or bookshop, and ask friends if they know and could recommend sources of information and/or Tarot Readers in your area. Not only should you receive interesting and enjoyable experience, but you will also benefit from a personal demonstration of Tarot Reading. That may be very helpful if/when you go on to read and perhaps follow Tarot Card reading instructions yourself because you will be able to remember how the reader you visited implemented all of the steps involved - or at least some of them, not all are obvious ! If you do decide to have a personal Tarot Reading as part of your process of learning to read tarot cards you might find the experience more useful in person than via a telephone tarot reading. That is not a criticism of telephone or online tarot readings from the point of view of the information and insights offered, just obvious concern that you may learn more about reading tarot cards yourself from both watching and listening to a tarot reader than by listening alone. Bear in mind that one great way to try out different tarot decks is to try some of the many free online readings available on the internet. Many of these are offered by the publishers of the various tarot decks - who may offer these free readings to give you an opportunity to choose their deck over others. It seems like a nice way to do that ! Even before you have learnt the meanings of all the individual Tarot Cards do read about a few different spreads and try some out, by looking-up each card as you turn it over if need be. This will help to give you a "feel" for tarot, plus it is a great idea to get a bit of practical experience to see how much you will enjoy it - some people can find it quite hard-work learning list of associations and explanations for 78 different cards so if you start by such solid study there must be a risk of getting bored quickly and giving-up. Research the subject of Tarot generally - as mentioned earlier. Get a good understanding of how a tarot deck is made-up and of each of the five main parts, i.e. The Minor Arcana - Suit of Cups or equivalent, as the name of the suits vary from deck to deck. The Minor Arcana - Suit of Wands or equivalent, as the name of the suits vary from deck to deck. The Minor Arcana - Suit of Swords or equivalent, as the name of the suits vary from deck to deck. The Minor Arcana - Suit of Pentacles or equivalent, as the name of the suits vary from deck to deck. Learn about and memorise the significance of each individual Tarot Card. Large task! Test yourself. Give yourself "one-card readings". This should be fun & easy. Most Tarot Decks fit easily into handbags or other items you carry around with you anyway so ... practise, revise and learn on the bus or train, while waiting in line, etc..
Having researched various spreads, choose 2 or 3 to concentrate on initially. Ideally choose one with just a few cards , say a 3- or 5-Card spread, and another larger spread involving 10-15+ cards. It is important to be able to perform larger spreads, which can be trickier. This is because the significance of certain cards overlap and/or depend on their position within a spread. The more tarot cards you are working with at any one time the more you also have to be aware of the other cards around any one particular card and the more difficult it can be to identify overall trends and themes. Remember you must be in the right, calm, open, receptive, non-emotional, frame of mind or order to read Tarot effectively. With the exception of the last comment above, steps 1. - 4. alone are entirely left-brain (that is analytical, logical, sequential, emotionally "neutral" and, overall - traditionally "academic"). Please understand that Tarot Reading is primarily a right-brain (intuitive, holistic, artistic, "feeling", subjective) activity. Steps 1. - 4. are listed first because they are essential. They are not, however, sufficient. To perform tarot readings based on steps 1. - 4. (above) alone would, at best, result in somewhat stilted, robot-like, statements of cards relative to positions. With sufficient time and effort one could program a computer to generate such "readings". We assume that is not what you hoped to achieve when you decided to investigate learning to read tarot cards. So, in addition to steps 1. to 4., it is essential to develop your intuition and sensitivity to tarot cards, and the whole "emotional environment" of tarot card reading - or any other type of intuitive reading, for that matter ! When you start applying this (Step 6.) by bringing Steps 1.-4. together with Step 5., and only then, you will have begun your tarot card reading experience. However, it is a long journey that consists of both left-brain knowledge of the tarot, tarot decks, tarot spreads, tarot history, and so on and the right-brain skills that are far more challenging for most people in this modern age. Note that neither the left-brain knowledge nor the right-brain skill is sufficient; tarot reading relies on the ability to seamlessly integrate these achievements. Even that is not really sufficient because most tarot readers read for other people - which also involves further personal and communication skills ! The importance of experience cannot be understated. Practise on yourself, performing readings about different types of questions and situations. Also practise reading for others as much as possible. It may be tricky to organise but reading for complete strangers is ideal. If possible, read for total strangers who are not in any way hostile (they might call it "sceptical") towards tarot but who are not "devotees" (over-keen, may take your comments too much to heart) either. It's especially helpful if you can get access to some such people who are also willing to give you their honest feedback afterwards. ... That really does mean AFTERWARDS - not by interrupting you, disrupting your flow, or otherwise adversely affecting your confidence. Tarot is inherently personal. Learning to read tarot cards is not just about looking-up and memorising "meanings" from books, it is about developing every aspect of the experience that you have (and can offer to others) using Tarot Cards. Is this all there is to Learning to Read Tarot Cards ? No, but we think it's a fair start. Many whole books have been written about learning to read tarot cards. A description of the process certainly requires much more than just one page. 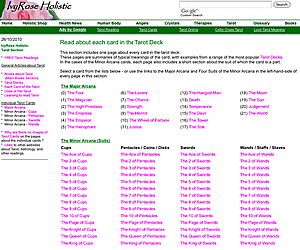 This is intended to give an indication of what is involved in learning to read tarot cards. For more about using Tarot Cards to give a typical Tarot Card Reading see the page about Tarot Card Reading Instructions. - Article added 30 October 2010.